What is the ultimate end of life? Is there a purpose or goal beyond character development? Do Christians really care what the Bible says about it? Most people are willing to put up with quite a bit of hardship if they know it’s for a worthy cause. For those who don’t believe in an afterlife, the best they can do is try to make the world a better place for the people who come after them. But for Christians, or anyone else who believes in eternal life, what we do here has much greater importance. Or does it? According to an article at Religion and Ethics, there are three "wrong ideas” about this, starting with the idea that we return to something like the Garden of Eden, which is just a "popular motif” and, be ye warned, is "more typical of Islam”. But by that same fallacy of guilt by association, the expectation of a Messiah figure is also Islamic and we must run far away from it. So also is the idea of there being only one God, and the list could go on. And if we’re Christians, shouldn’t we be getting our teachings from the Bible? The fact is that the Bible teaches a return to an Edenic state on earth. For example, Isaiah 11:6, 65:25 tell of a future time when the wolf and lamb will lie down together, and even the lion will be vegetarian. 2 Peter 3:13 speaks of a new heaven and earth "where righteousness dwells”. How is this not a return to Eden? And isn’t such a return the whole point God will make in the Millennium, that even when mortals are in a perfect environment, they still easily turn away from God? The second "wrong idea” is that Christians are charged with building a better world themselves rather than it being done by God, and on this point I agree. Dominionism is the name typically used by those Christians who are bent on installing a global theocracy, and the Bible clearly teaches that it is God alone who will bring this about. The church is never charged with anything but spreading the Gospel and living the example of Christ, rather than plotting to subvert or topple godless governments. The third "wrong idea” is that we Christians will all go to heaven. But here the article mixes truth with falsehood and seems to greatly oversimplify the Bible’s teachings on the afterlife. Heaven is indeed "the abode of God and of other spiritual beings”, but also of human souls, even if temporarily. Rev. 6:9 shows souls at the base of the altar in heaven, asking God for revenge on those who had martyred them. Rev. 7:9-17 shows a multitude of humans in heaven who "come out of the Great Tribulation”. There are three venues in which the apostle John is shown the Revelation: heaven, earth, and visions or signs, and these souls just mentioned are clearly seen in heaven, in the presence of God. Yet this is not "the sky” as the article claims, since many of the terrible judgments are happening in the earth’s atmosphere as well. And if we look at Gen. 1:14-19, the sky includes the sun, moon, and stars, and thus cannot refer only to the atmosphere. Again the article poisons the well by assigning the idea of people in heaven to other religions ("This is actually a Greek or Indian ideal"), in spite of the many scriptural affirmations of it. I can agree that the "ethereal realm” beyond the physical is "utterly unsuited to flesh-and-blood human beings”, but who says that humans are mortal in heaven? Again, Revelation describes people in heaven as "souls”, and in 2 Cor. 5:8 Paul says that to be absent from the body is to be present with the Lord. Paul was not eagerly awaiting a long sleep of unawareness but the joy of being in the presence of God, knowing that he would eventually receive the immortal body we will all be given at the Rapture (see 1 Cor. 15:20-54). 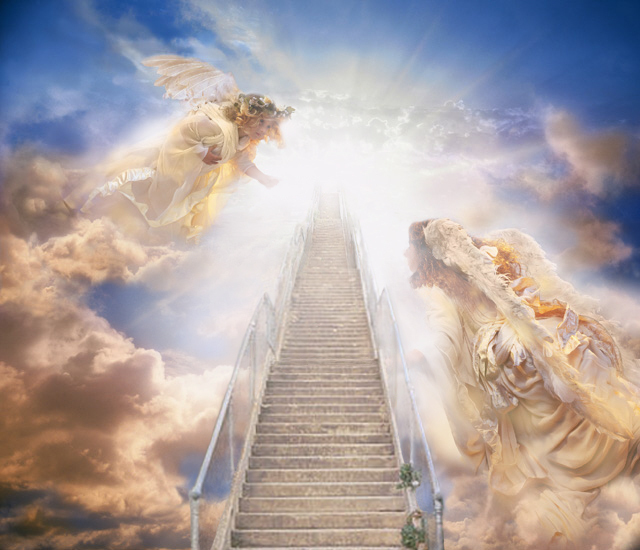 Every Christian who has passed away up to this point is presently in heaven with God, souls without bodies, awaiting the arrival of the rest of "the full number” to come (Rom. 11:25). Now we move on to implications of these "wrong ideas”. As mentioned already, the second one about Dominionism does indeed pose a danger. Many who follow that teaching strive to subvert and impose government, sometimes by any means necessary. It fosters a chain-of-command mentality, an army model, which has led to the spiritual abuse of many (see this post). Yet if the article being examied argues against "kingdom now” theology, then how can we describe its objection to the idea that Christians’ destiny is in heaven, at least until the end of the Millennium when the New Jerusalem descends from heaven? If our destiny is not "in the sky” nor "on earth”, then where is it? And if on the earth, then how is this idea not as wrong as Dominionism? There is a very thin line betwen earthly theocracy by God’s gift alone and that which humans would do, since the humans doing it would claim that they are the means by which God does his work. What could be wrong with the idea of a return to Eden? The article answers that it "suggests that any progress we make in this life doesn’t really matter.” But this is a non sequitur; it makes no such suggestion. The "progress” we make as individuals is personal and pertains to character and eventual gifts/rewards. Collectively, as already explained, it proves that mortal humans find a way to rebel against God even in the most pristine of environments, which by the way, refutes the idea that we can make the world a better place solely by eradicating poverty. This "wrong idea” is explicitly taught in scripture. In fact, the whole purpose for Jesus to die and rise again was to restore what sin and Satan had taken away and ruined. Jesus is called "the last Adam” for a good reason, and one we cannot brush aside. Another non sequitur is that "Aspiring to a spiritual heaven suggests that nothing material actually matters”. Again, this oversimplifies and ignores the fact that souls do indeed go to heaven, and that some have been there for thousands of earth years. The righteous will indeed get new "spiritual” and immortal bodies of flesh and bone, but neither of these states of being can justify the leap to "nothing material actually matters”. Is not the entire New Testament filled with exhortations to meet physical needs as well as spiritual? And we are told explicitly that the purpose of the Bema Seat judgment is to examine "deeds done while in the body” (2 Cor. 5:10; see also this document). The article is proposing what amounts to another fallacy, that of false dilemma, that if it isn’t "this” it must be "that” and there are no other possibilities. In fact, what the article is arguing against is Gnosticism, not any Christian "idea”, and thus commits the fallacy of burning a straw man. The Emily Dickinson poem makes the same error; that she was not taught the reality of the afterlife but only the Puritanical "Sunday no fun day” idea. As for the New Jerusalem, the article seems unaware of the fact that it never touches the earth. Seeing that it provides light for the whole world after the Millennium (Rev. 21:24), one is challenged to explain how an earth-bound city lights the whole world. A space body like the sun would make much more sense, and again there is nothing stated explicitly in scripture about it touching the earth. And there is more than one Jerusalem coming; see Appendix D: Three Prophetic Cities. Once again, the problem is oversimplification and confusing some prophecies with others. And again we ask a question of consistency in the article: If, as it states, God "resurrects the earth as well into a resplendent ecology of vitality and beauty in which all live in mutually beneficial relationship with each other”, how is this not a re-creation of Eden on the earth? How does this "idea” not render life futile? How is it that "the individual matters” in this scenario but not in the Biblical one where souls spend time in heaven and then will be rewarded (or not) for what they did while mortal? The article’s list of six "matters” is all predicated upon fallacies including false slippery slopes, as have been explained here. Ironically, the article nears its end with a section entitled "Transcending the zero-sum game”. The irony, of course, is that zero-sum has been used throughout the article with its false dilemmas, which really are zero-sum arguments. And the section really does nothing to contradict what it set out to refute. No one is arguing that the first and third "wrong ideas” mean that we show no compassion for the suffering, or that we feel we must live in poverty ourselves. This again is burning a straw man and false dilemma. The New Testament teaches people to earn their own living, to show real and physical compassion for the suffering, to seek peace, and to spread the Gospel. No connection can logically or theologically be made between the 1st and 3rd "wrong ideas” and the neglect or negation of these scriptural teachings. Finally, as stated here at the top, we agree that one’s beliefs about the afterlife affect how they live in the present. But we certainly are, per explicit scriptural statements, "going to heaven” at least for the duration of the wrath of God on the unrighteous mortals, and the church will dwell in the New Jerusalem above the earth. And there is no evidence that those who disagree with the article and hold to the 1st and 3rd "wrong ideas” behave in the manner the article presumes. This is actually slanderous against them, those nameless millions, who do in fact care for the suffering and work hard in this life for the coming Kingdom, while also believing that we will indeed "go to heaven”. The core of the New Testament message is that because Jesus rose from the dead, we too can be reconciled to God by faith rather than works, and that it is HIS righteousness, not our own, which saves us. Salvation is a gift, restoration is a gift, and the hope of heaven is also a gift. But one might conclude from the article that these millions of alleged heretics will not receive any gifts, not because they rejected Jesus or failed to care for the oppressed, but because they saw promises of heavenly bliss in scripture. Is this a fallacy as well? Then let the same standard be applied to both sides. We either comdemn people without a trial, or we patiently seek out what they actually believe and what the real implications are. Articles that make sweeping judgments of others on the basis of numerous fallacies and inadequate consideration of all the teachings of the Bible are, in themselves, a greater danger than "wrong ideas”.